As National Chocolate Week draws to a close, I know of one lady who will still be celebrating. 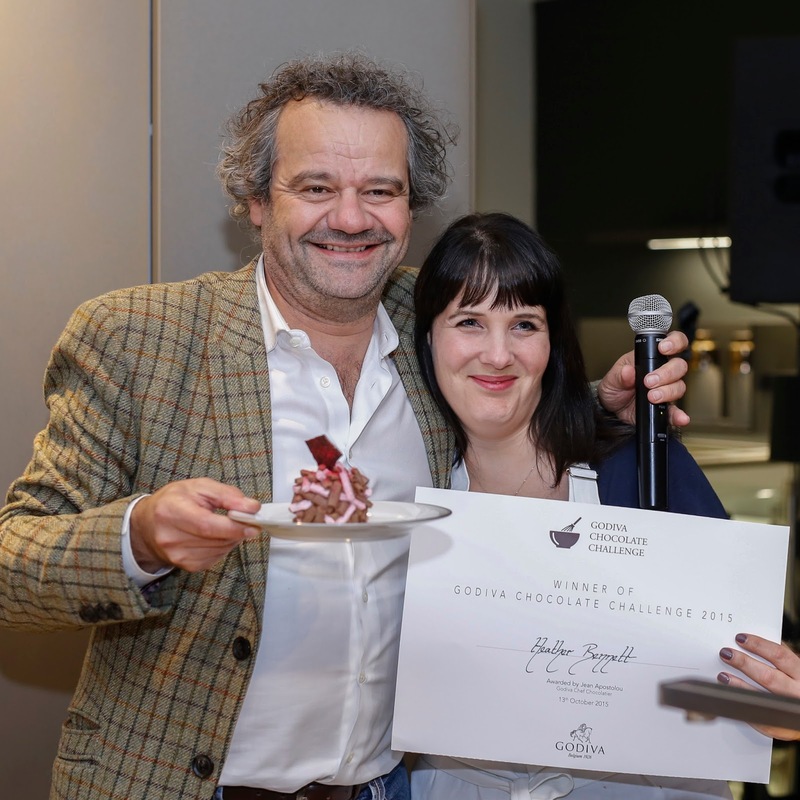 Last year's Godiva Challenge Winner, Heather, returned this year as a finalist and according to the judges, it was no 'Hix Fix' that she retained her title. 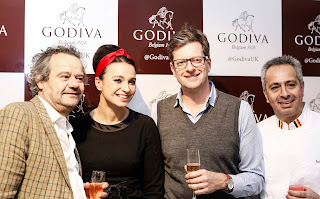 The four judges, Mark Hix, Gizzi Erskine, William Sitwell and Godiva's Master Chocolatier Jean Apostolou (an old friend of mine ;)), took a little less than an hour of deliberation whilst us honoured invited guests (and non-finalists) mingled and tasted the four desserts. Impressive skills, a high standard and being able to taste the fine chocolate ingredients was key in their decision. Each finalist reproduced their dish six times - four for each of the judges, one for photos, and one for the rest of us to sample. Heather's was really original, and so complex it took about six hours to re-create. Good luck with that to the professional chefs that will be serving it up in Mark Hix's Soho restaurant! 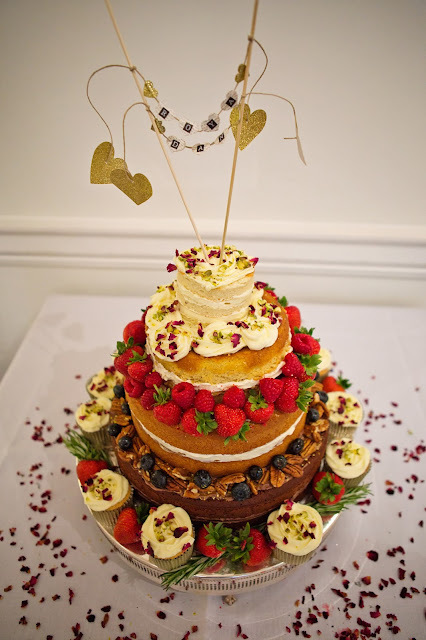 Anoop was supported by his lovely girl, who is always urging him to enter the Great British Bake Off. I reckon he would have a really good chance, his dish was perfection, in presentation as well as taste. 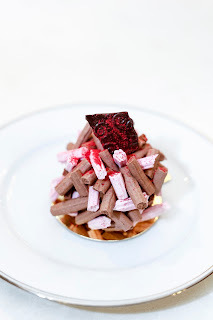 Nuts About Cherry: White Chocolate, Cherry and Pistachio Delice, Macarons, Tempered Chocolate, Kirsch Cherry and Ganache. Joe's beautiful dish showed off his chef skills with originality and opulence. An explosion of chocolate flavours. You Can Eat Flowers: Chocolate and Rose Mousse, Kirsch Ice Cream Meringue, with Edible Flowers. Rosanna's dessert was, in my humble opinion, home cooking at its best. Although delicious and extremely skilled, it's also quite an accessible dish, which I hope to re-create soon. You can find Rosanna's recipe here. 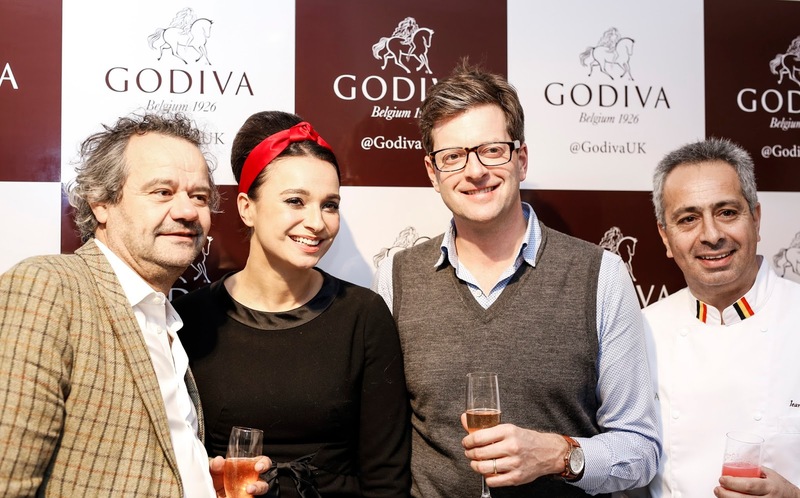 Another wonderful evening hosted by Godiva. And better still, for every purchase of their delicious Mousse Meringues, they will donate a percentage to Breast Cancer Now. What better incentive to indulge in some luxurious chocolate? Chef and Judge Mark Hix with the Godiva Challenge Winner, Heather. Photos courtesy of LuxxPR, Photography by Carl Pendle.